14 years ago Deloitte Consulting experts predicted that businesses would entrust their IT projects to third-party software development agencies to reduce costs. And eventually, it came true: according to GSA, 70 percent of companies plan to outsource software development and the software outsourcing market will grow 6 times up to $409 billion in 2020. If you have a web or mobile app idea, or maybe need an enterprise solution, an outsourcing software development firm will be the perfect partner for you. The hard question is how to find the right developers when there are plenty of them in the list of software development companies in the USA. Read our tips in this blog post and you’ll get past the fear of tough choice. 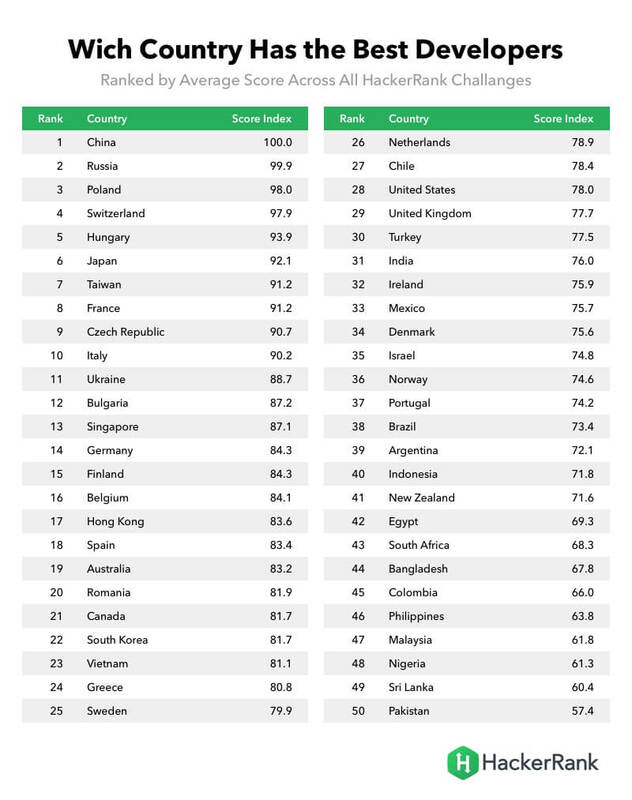 According to HackerRank, Russia is in the top three developers of the world. Think of what is more convenient for you — to meet developers personally as often as possible or chat with them remotely via messengers and video conferences. The answer will help you to define the search radius. With local partners, you won’t suffer from the time zone difference. Local developers can be available for personal meetings although today everyone relies on modern digital means of communication regardless of the geographical location. Although, a local software development firm can better understand the target audience mindset provided that your future product is aimed at the local market. Outsourcing software development companies are usually more affordable at an hourly rate than local. With different digital tools like Skype, Hangouts, Cisco Webex, Slack, Hipchat, JIRA, Redmine, that these companies use for managing and discussing software development projects, you won’t see the difference in communication. Begin with the Clutch.co — the international platform for ratings and reviews of leading IT, marketing, and business services companies. Clutch experts designed their own way to evaluate different market players. They collect feedback from clients of the companies from their ratings, analyze industry data, and publish it on their platform. 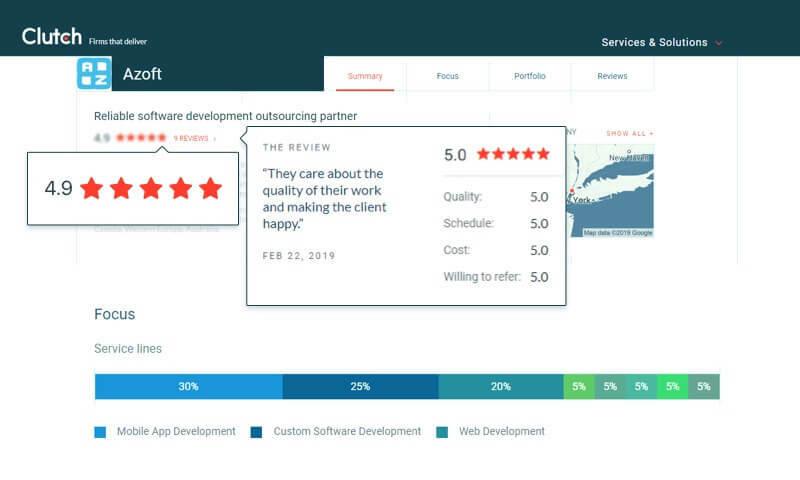 The more positive reviews in the profile of a software development agency, the higher position they get in the ratings. How to find a software development firm via Clutch? Pick the rating you’re interested in. For example, choose Top mobile app development companies. There are more than 12000 firms. Don’t panic! You can filter them using various criteria: from project size and average hourly rate to industry focus and location. You can compare reviews about the companies you choose on other rating platforms such as TopDevelopers, Appfutura, CrunchBase, IT Firms. If you look for a company with a strong UI/UX design expertise, check out their profiles on Behance and Dribbble. A big advantage of the developer is expertise in the product you need. This means they understand the features of the project, timeframes, and budget. Check the "Portfolio" on the website of a potential vendor and evaluate the level of work. If case studies include websites, follow the links and see for yourself what it looks like. If mobile apps are listed, take a look at the App Store and Google Play, find out what the app's ratings are. You can even download them to your smartphone and test it. Ask for what part of the work the company was responsible for: it can happen that a developer was responsible for design but he says that he created the whole product. Any software development agency works across industries. If a company has been on the market for a reasonable time, it means they should have enough knowledge and rich expertize in a variety of niches. For example, our company of more than 17 years provides outsourcing software development services. From the very beginning, we partnered with 2 leading insurance companies in the US. During our work over similar projects, we dived deeply into the details of the insurance business. We also trained our skills in other industries: telecom, health care, logistics, retail, education. 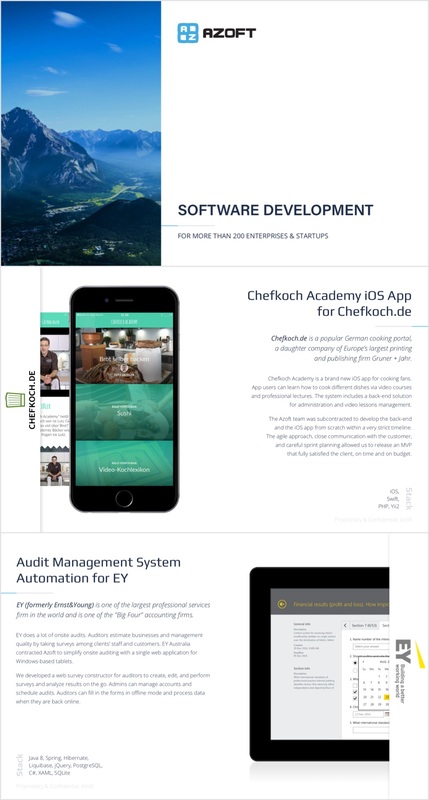 Ask your future software development partner what technologies they use: experienced and modern companies follow the trends and adopt new practices and ways to solve tasks. It’s good when a developer explains in details why some languages and frameworks would be better for your project. Don’t rely only on the costs of the project if you need quality and not a cheap product. If you feel that you’re going over budget, take your time, ask your software development agency for expert advice. Keep your idea and look at the options. Sometimes it’s better to start with MVP, to test your concept. A reliable developer will gather and evaluate your requirements, then offer you the possible options. Find a pricing model that your developer suggests using. The most popular models are Time & Material — for non-standard and sophisticated software and Fixed Price — for standard projects with clear and detailed requirements described in the specification. The evaluation will help you to understand how much time a developer will spend to complete each task related to the various features and components of the product. Give the specification with requirements to your product to different software development firms. Be ready to reply to questions. If you received an evaluation immediately, that means the developer sent you an average estimate and didn’t look into your specification. A basic estimation requires 3-5 days and you will see the result for top-level tasks. If you need a deeper estimation, it takes about 7 days but you’ll get a precise estimate with every single detail considered by a business analyst. Find out what kind of support your software development company offers you when the project is finished and released. 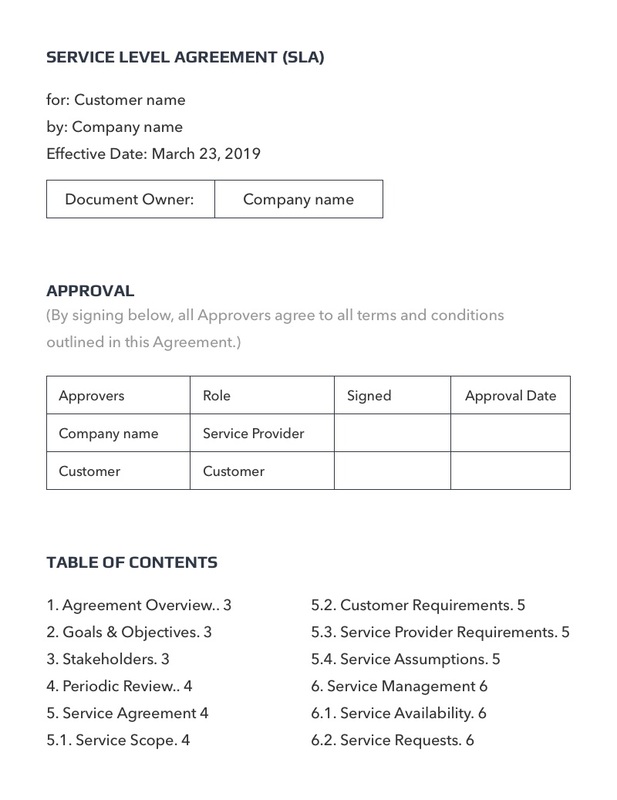 The parameters of support are fixed in an SLA — Service Legal Agreement. Define what warranty is provided by the SLA. Usually, not less than 3 months, but we offer support for 1 year after launch and fix any bugs. A good custom software development company is located in a country where software engineers are recognized around the world. It has positive reviews and high scores in ratings such as on Clutch.co, TopDevelopers, Appfutura, CrunchBase, IT Firms. A portfolio containing not less than 5-10 similar works. The company has experience in your business niche. They offer modern tech stack for your project. SLA and NDA are provided upon request. There are examples of UI/UX design works on Behance or Dribbble. A clear pricing policy: Fixed Price model or Time & Material. A precise project estimate in man-hours based on the requirements specification. 12-month warranty and support after release. Insourcing Software Development Strategy: Is Going Back “In-House” Your Best Choice?